Arianespace’s on-target mission with Horizons 3e and Azerspace-2/Intelsat 38 marked the milestone 100th flight of a heavy-lift Ariane 5, confirming this workhorse vehicle’s role as the launch services industry reference in reliability, flexibility and performance. 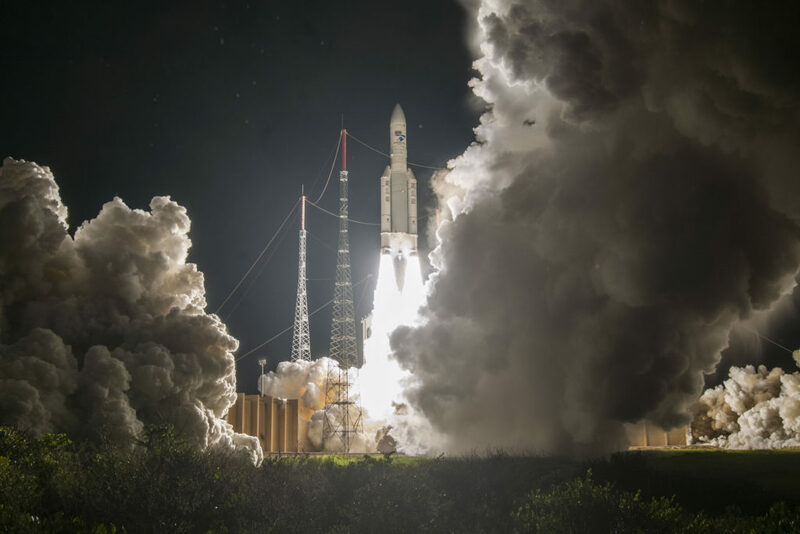 With the deployment of its latest two passengers during a 42-minute flight from the Spaceport in French Guiana, Ariane 5’s combined lift performance over these 100 missions exceeds 790 metric tons – including a total of 207 satellites for 68 customers around the globe. Overall, the launcher has achieved a remarkable 98.1% reliability rate during more than 22 years in service. Tonight’s success also marked the 300th flight by a member of the company’s family of launchers, in which Ariane 5 is joined by the medium Soyuz and lightweight Vega. Designated Flight VA243, today’s heavy-lift success continues long relationships of trust between Arianespace and the mission’s customers. Horizons 3e was released first in the flight sequence, being deployed from the upper slot in Ariane 5’s payload configuration, followed by Azerspace-2/Intelsat 38, located in the lower passenger position. Total lift performance to geostationary transfer orbit (GTO) was estimated at 10,827 kg. Horizons 3e was lofted for a joint venture of Intelsat and SKY Perfect JSAT Corporation. Built by Boeing using Intelsat’s EpicNG design, it will provide coverage for aeronautical and maritime mobility, fixed and wireless operators, as well as mobility and government customers. It also is the first satellite in Intelsat’s EpicNG spacecraft series to feature entire Ku-band spot beams utilizing multiport amplifiers that optimize power across the spacecraft. As a special payload on multiple fronts, Horizons 3e is the 60th Intelsat satellite to be launched by Arianespace overall, as well as the 20th for SKY Perfect JSAT. In addition, it is the 56th Boeing-built spacecraft orbited by the company to date. Azerspace-2/Intelsat 38 – built by SSL, a Maxar Technologies Company – offers 35 active transponders in Ku-band and has designed lifetime of more than 15 years. With today’s success, Arianespace has now orbited a total of 65 satellites produced by SSL. Azerspace-2 will increase the coverage area and spectrum of services provided by Azercosmos, expanding on the current capacity of Azerspace-1 – the operator’s first relay platform, launched on an Arianespace Ariane 5 mission in February 2013. The latest spacecraft’s planned orbital position is only one degree away from the current Azerspace-1 location at 46° East, which creates favorable opportunities for existing and new customers to start expanding their current satellite solutions. Ariane 5 ascends from the Spaceport’s ELA-3 launch zone on its 100th flight, carrying a dual payload of the Horizons 3e and Azerspace-2/Intelsat 38 telecommunications satellites. Azercosmos Vice Chairman Dunay Badirkhanov thanked Arianespace for a “spectacular launch and an exciting journey,” adding that Arianespace’s launch services have enabled Azercosmos to become a leading satellite services operator in its region of the world. Intelsat 38 will provide Ku-band capabilities and deliver continuity of service for the Intelsat 12 satellite located at 45° East. The newly-launched satellite will host leading Direct-to-Home television platforms for the fast-growing Central and Eastern Europe and Asia-Pacific regions, as well as provide critical broadband connectivity for corporate network and government services in Africa. It became the 61st Intelsat spacecraft lofted by Arianespace. Following Flight VA243’s liftoff and subsequent satellite deployment, Israël took the opportunity to acknowledge the industrial and infrastructure teams that continue to support Arianespace in its commercial Ariane operations – including the vehicle’s production prime contractor (as well as Arianespace’s main shareholder): ArianeGroup. Flight VA243 was Arianespace’s sixth launch in 2018, and it follows other heavy-lift Ariane 5 missions performed this year on January 25 (carrying SES-14 and Al Yah 3), April 5 (DSN-1/Superbird-8 and HYLAS 4) and July 25 (four Galileo satellites). 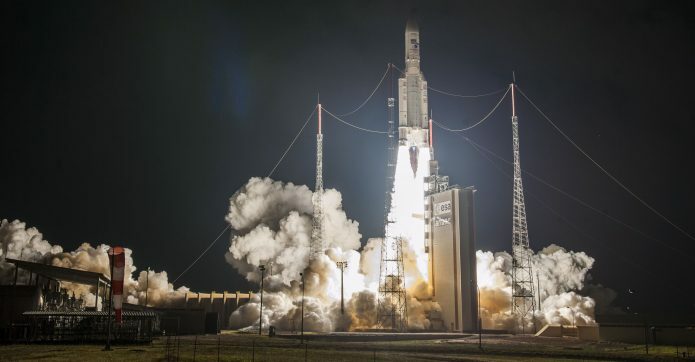 Also conducted earlier in 2018 was Arianespace’s medium-lift Soyuz mission on March 9 (with four O3b satellites); plus a light-lift Vega flight performed August 22 (Aeolus). Arianespace’s next launch – an Ariane 5 flight that will send the BepiColombo scientific mission on its way to planet Mercury – is planned for October 19, at the service of the European Space Agency (ESA) and the Japan Aerospace Exploration Agency (JAXA).